Windsor Police are seeking the assistance of the public in identifying a suspect involved in the robbery of a cab driver earlier this week. Just after 8:00 pm on Monday, October 24, 2011 police were called to the intersection of Cameron Avenue at Wyandotte Street West by a taxi driver who reported being robbed by a suspect with a knife. The cab driver told police he had picked up a lone male 8:05 pm. at the intersection of University at Crawford. The man sat in the front passenger seat and asked to be dropped off at the corner of Cameron at Wyandotte. The driver took the man to this location and upon arrival, the passenger brandished a knife with a six-inch blade from his coat pocket and demanded the cab driver’s money. The cab driver complied and handed the suspect a quantity of cash. The suspect then exited the vehicle and was last seen fleeing on foot westbound through the alley. The taxi driver was not physically injured during the confrontation. A police K9 Unit attended the scene but was unsuccessful in tracking the suspect. 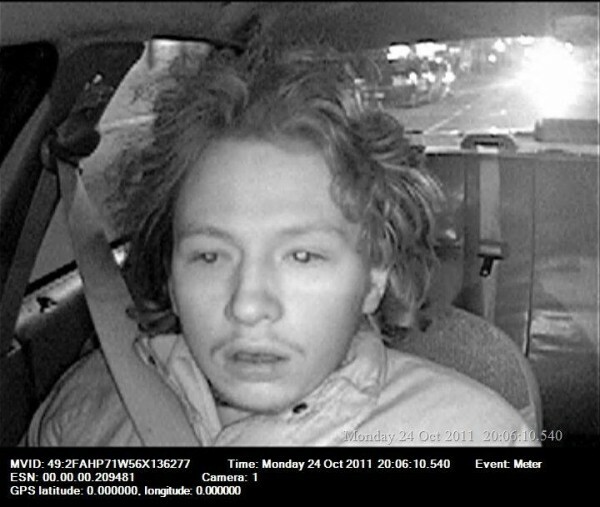 The above still image was obtained from surveillance video from the taxi cab. The suspect is described as a male, approximately 20 years, curly brown unkempt hair, 5’5″, 150 lbs. He was wearing a knee-length brown jacket and spoke english.